So I have recently experienced the belt shredding oil leaking nightmare. I have checked the PS pulley and there is no damage to it. I have had my oil filter housing gaskets replaced which is where I though the leak was coming from but it now looks like the oil is coming from the front main crank seal. I have read a few posts about how the belt can literally get sucked into the engine through this seal and I am kind of freaking out about the possibility of having to buy a new engine. 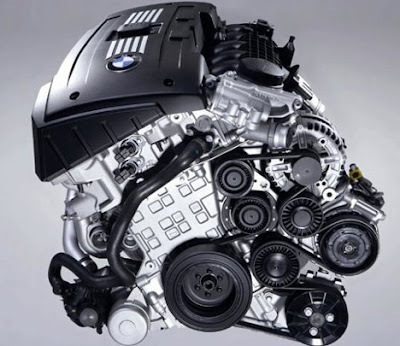 So I am taking the car to a local BMW shop as she is out of warranty however I have been working to locate all the required parts to get this resolved. Apparently you are required to use two special loctite glues well one of these things its not possible to find in the US Loctite 171000 you have to order it from Germany (side note WTF is that about) after talking with a tech analyst at loctite we found a comperable but not an exact match for this primer. And the glue as well as crank seal I am having shipped to me. I am just curious what the likelihood that this belt actually got sucked into the engine or if it just damaged the seal. And if anyone has an experience with my loctite primer and sealant issues. as you can see the drive belt is at the very front of the engine. behind that is a metal timing chain cover which is sealed to the side of the cylinder block/head.....with that being said, there isn't a snowballs chance in hell that belt is getting inside that engine. so dont get over worked and dont let the dealer bend you over! on a side note, i dont know what the deal is with the "special" loctite your talking about, but if you want a bolt to stay there is nothing more i would trust than red loctite. Last edited by A L I A S; 12-19-2012 at 11:20 AM. horribly sorry about that, i just noticed you have an e92 335i!!! again same principle applies, you have the drive belt with all your accessories on the very front of the engine. in this picture you can actually see almost the entire metal timing cover...the crank seal is behind the big crank pully. So with that being addressed, the huge crank pully has to be removed to get to the crank seal. theres just no way the drive belt is going anywhere near the inside of the engine. Well I believe the belt has wrapped itself around the crank and damaged the seal so I hoping its just that simple and the issue will be resolved. As for this loctite bs BMW specially contacted them for a glue that would active both by contact with metal and with UV light. Well u can get the sealant from a dealer however the primer is NOT available in the US it has to be shipped from Germany and there is no exact US conversion per my conversation with a loctite technical analyst. This combo is mentioned is the tis and bolded to tell you if you don't use it you will not resolve the oil leak. My comvo with loctite has made me decide that I will try a US primer as it should work and see how that performs. If anyone has this issue please let me know I would more than happy to discuss what my hours of research has found and what the result is once the work gets done. Have to look up the US primer equivalent but you should be able to order the glue from a dealer make sure it comes with the needle tips you'll need them for application. My apologies I completely forgot to look it up. I used Loctite 7649 best of luck to you. I recommend you buy the aerosol version easier to coat everything that way. I have the seal removal tool and some of the BMW sealant left over, will sell both for $75. I assume the sealant is still good, it has been a few months, I haven't checked. could easily prevent the intake of a shredded belt. cause the belt to not wrap around the crankshaft. Can you shoot me an email? Still have the tool? You couldn't be more wrong, just take a look through this board. there are more than a few reports of this happening. This crankshaft seal is a PIA-- -on my 2nd and still leaking. I used the L-171000 primer on the key holes and the block side of the seal and let sit for 2-3 minutes, then used L-5970 flange sealant to the key holes and primer on the outside of the keyhole. Let sit over night and still leaks. Sounds like your process is correct. Is the bore damaged? Are you using the install tool? 193140 is the flange sealant that I just tried. I only primered the block circumference but not the seal...and the key holes.... that sealant remained tacky and never became a sealant when I brushed it on the grooves at the keyholes. This sealant didnt have a plunger either so infound one that somewhat fit but did push it thru the needle. I have not mic'd the bore yet...was going to try once more since flange sealant didn't set. I did but the 175 puller and install kit. 193140 is the flange sealant that I just tried. I only primered the block circumference but not the seal...and the key holes.... that sealant remained tacky and never became a sealant when I brushed it on the grooves at the keyholes. I have not mic'd the bore yet...was going to try once more since flange sealant didn't set. I did but the 175 puller and install kit. I know when I did mine I remember reading that some people didn't even use the sealant/primer and had no problems with leaks. I wouldn't think applying the primer to the block vs the seal would cause your issue. I didn't even use the install tool. Just pounded it in with a rubber mallet and it never leaked. These engines eat belts like it’s in fashion. I have seen a YouTube video where people smear regular RTV before install. I imagine it would be the same, anyone tried that? It is only for the seam line, and OEM seal has 2 indents at those locations right? Last edited by labrador; 03-18-2018 at 10:10 PM. Well my problem is solved and thought to post it for anyone else running into the issues I had. Pulled out the black max strength oil resistant Permatex 82180 and works like a charm. Thank you for the confirmation!! Yes Permatex Ultra Black is a fave of mine. It just seemed like BMW was unnecessarily taking the long road on this one. Now did you smear some before installing the seal, or as a fix after?